February is Heart Month and all around the Y, we are raising awareness of heart related diseases and some habits to stay healthy. Today, we are excited to announce a new opportunity to give back to our community through the Hug A Heart program. What is Hug A Heart? Hug A Heart is a program where you can volunteer to sew a heart-shaped pillow that will be donated to cardiac patients at Ellis Medicine. 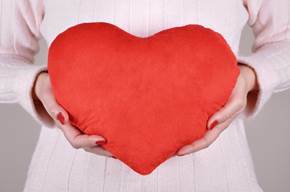 These heart-shaped pillows are used to help ease pain and aide in post-surgery recovery. Use fabrics that are comforting to the touch – fleece, microfibers, flannels, 100% cottons or velvets. It should be washable at 40° C. Fabrics do not have to be the same. Play with some fun and cheerful combinations that are soft, feminine designs for women, or special designs for men. You will need two pieces of fabric about 16 x 20 inches (40 x 50 cm). Pin or trace the heart pattern on the fabric and cut. There is already a ½ inch (1.5 cm) seam allowance in the pattern. Place fabric right sides together and stitch all sides with the ½ inch (1.5 cm) seam allowance, leaving a 4 inch (10 cm) opening to turn. Clip excess fabric at corners and notch inside and outside curves. Turn pillow right side out. Press lightly, then stuff with fibrefill (about 170 grams). Stitch fabric opening closed by hand or machine. Place in a plastic bag, close with a pretty ribbon/card. Bring the completed pillow to your closest YMCA so we can deliver to Ellis Medicine.